So with the exception of the "Chocolate Milk and Poo" colors. I quite like the Rebel Debutante collection. This collection is all cremes and has nice variety. Again, I found these in a set at Ross for $7.99. Seven colors for $7.99 is a great deal! High Society is a grey creme. I'd say this leans slightly on the warmer side, but is more neutral. I used to be very anti-grey polish, but I'm warming up to them. I love this shade and I'm really into the more fall-like colors right now. Ms. Socialite is a red-toned purple creme. I like this one it's a nice variation from the more blue-toned purples I'm used to. She's so Glam is a bright pastel creme. I am not a fan of pastel pinks cremes unless they have a jelly,glitter, or shimmer finish. I think this an overall nice color, but like I've mentioned before I connect pastel pinks with Pepto Bismol and the various stomach bugs I had growing up. Cute color, but I'll pass on the Pepto! This makes me want to break out into that Billy Joel song, but I'll spare you the torture. 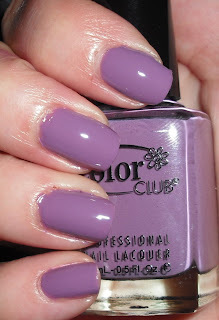 Uptown Girl is a lavender creme. As opposed to Pepto, I love lavender! This is a beautiful shade and another one of those muted fall-like colors I adore. Who Are You Wearing? is a off white creme. This has a hint of grey to it. Not a fan of this light of a color on my nails without a different type of finish. It's a bit to stark for my skintone, but besides that point is a lovely color. That's it for today. Sorry for the not so conversational post. I have plenty of errands to run today so less time for chit chat! I hope you all have a wonderful day though! society is amazing, i love this one !!! I have yet to find these at my Ross, hmm. Ms. Socialite sure is a pretty one! Thanks a lot, Steph! I had to visit clients in Oviedo today. I passed 2 different Ross stores. I wanted to stop in and see if I could find any polish goodies, thinking of you. However, I, somehow, talked myself out of it and drove by. Drove by 2 of them!!! You did a great job on swatching. And you know what? I actually like the 'Who Are You Wearing?' despite the odd name. Lovely colours, I like them all. Wow pretty colors. I really like the ms.socialite.